While many assume the Miniature Pinscher is a small version of the Doberman Pinscher, the two breeds are not related. The Min Pin was developed first—and separately. With such a big personality it is fitting that the outspoken and extroverted Miniature Pinscher is referred to as the 'King of the Toys.' Originally bred as a ratter, the Miniature Pinscher is a spry and determined breed whose intense energy and prey drive have remained. He'll likely bark at and chase other animals, even bigger ones. As such a territorial breed, this dog needs early socialization and consistent training from puppyhood. The Min Pin may be a difficult breed for a first-time dog owner. Though a challenging breed, the Min Pin is also devoted to his family and may make a cuddly, affectionate choice for someone with the time to dedicate to training. The Miniature Pinscher is also known as Min Pin. Coat - The short, sleek coat of the Miniature Pinscher may be stag red, black and rust, or chocolate and rust. 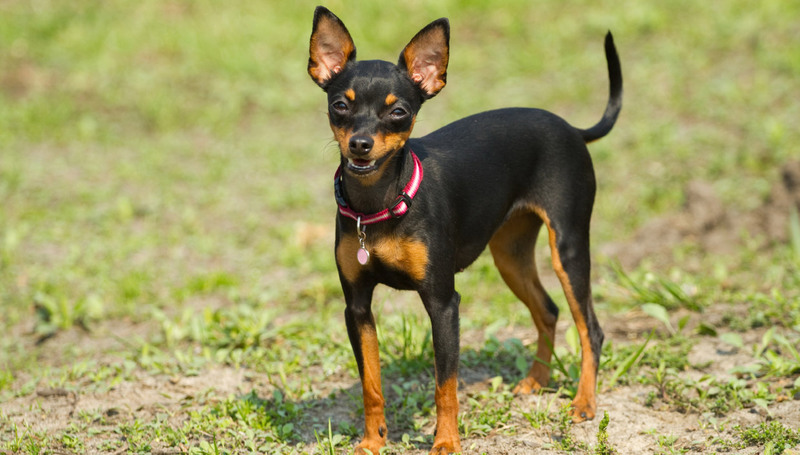 The Miniature Pinscher was developed in Germany more than 200 years ago as a ratting dog. Though similar in appearance to the Doberman Pinscher, the breeds are separate—development of the Miniature Pinscher included Dachshund and Italian Greyhound, not Doberman. It was originally called the Reh Pinscher as the Min Pin resembles a small, local type of deer called reh. The breed's popularity rose during the end of the 19th century. America's first Miniature Pinschers arrived in 1919, the Miniature Pinscher Club of America was formed in 1929, and the American Kennel Club (AKC) accepted the breed to the terrier group in 1929. In 1930, Miniature Pinschers were reclassified as toys. Spirited, high-energy Miniature Pinschers are loyal and devoted to their families. They're little dogs with big personalities. They always want to know what's going on—but their curious, fearless nature can occasionally get them into trouble. These mini escape artists are lightning fast, so if they get loose they're likely to make the most of their adventure—and are not likely to come when called. Min Pins are often goofy and clownish, and always ready to perform. Are Miniature Pinschers Good with Kids? While usually gentle and affectionate with children, Miniature Pinschers do best with dog-experienced kids over the age of 10. A Min Pin is not likely to tolerate rough handling by children, and can be injured during rambunctious play. It is important to socialize Min Pins with children from puppyhood—even if they don't live with them—to prevent timid or snappy behavior around children. Are Miniature Pinschers Good with Other Pets? Miniature Pinschers do well with other dogs of all sizes, though they may try to assert dominance over other dogs—no matter which is the bigger canine. They have a strong prey drive do not make an ideal match for cats or small animals. Attentive and fearless Miniature Pinschers are always ready to sound the alarm. Min Pins make fantastic watchdogs and will alert you to newcomers, but they're not guard dogs due to their small size. Miniature Pinschers are lively and energetic. They require plenty of exercise—indoors and out—to keep them happy and healthy. Without an outlet for his energy, the Min Pin may become destructive, barky, or snappy. The Miniature Pinschers is an escape artist who is prone to wandering. The breed is often territorial. He has a high prey drive. He may become destructive when bored. He may have a suspicious nature. As a small dog, he is difficult to housebreak. Min Pins are known to bark. He is likely to eat found objects (coins, buttons, and other dangerous items). Indoor Miniature Pinschers are fond of a comfortable lifestyle and make wonderful companions inside if they have plenty of exercise to match their abundant level of energy. They prefer a lap to a dog bed and enjoy spending as much time as possible with their family. While the Min Pin might be a good fit for apartment living, he will need to be trained not to bark unless necessary—which may be futile. Exercise Enough daily exercise can help ameliorate the Min Pin's challenging behaviors, excessive barking, and destructiveness. While much of his exercise can be gotten through play inside, the Miniature Pinscher will benefit from walks and jogs outdoors as well. Endurance You're likely to tire out before a Miniature Pinscher. The busy little breed is happy to accompany you on your adventures around the yard and in town. But although he has plenty of stamina, his little legs mean he has to work harder to keep up with you. Running Miles: With proper conditioning, a Miniature Pinscher may be able to run up to one mile. This breed isn't built for distance running, but enjoys showing off with occasional bursts of speed. Hiking Miles: Agile Miniature Pinschers enjoy hiking and may be able to accompany you on a hike up to a few miles, but they are prone to wandering and chasing small animals—they should be leashed to prevent accidents. Food The general recommendation for how much high-quality dry dog food to feed a Miniature Pinscher is a half cup to one cup per day, split between two or three meals. This amount is based on average weight and activity level. While Miniature Pinschers may be territorial, they do not tend to guard their food more than any other breed. Children should never be allowed to touch or remove food from any dog while it is eating. Alone Time Though they may be left alone for four to six hours per day—preferably in a dog-proofed area or crate for safety—Miniature Pinschers may become destructive or bark excessively if they don't get enough exercise or attention throughout the day. Short, sleek Miniature Pinscher coats do not require much grooming. Weekly brushing with a soft brush and baths only when necessary are usually plenty. Too-frequent baths can cause skin irritation, so they should not be bathed excessively. Trimming nails regularly will help prevent painful splitting, cracking, or breaking a nail. You can minimize serious health concerns in the Miniature Pinscher by purchasing him from a reputable breeder who engages in responsible breeding practices, and through screening for common diseases and conditions. While incredibly intelligent, the Min Pin's stubborn streak may make obedience training more difficult than with other breeds. They are known to outsmart their owners and often attempt to establish top-dog status in the household. A firm, yet gentle, training technique will work best. Early socialization with other people, children, and dogs is important to prevent timid or snappy behaviors in full grown Miniature Pinschers. Leash training and a solid recall are also high-priority skills to teach to this escape artist. Miniature Pinschers may be slow to housebreak. Miniature Pinschers are show-offs at heart and love to perform. Advanced tricks may be a fun way to help Min Pins burn excess energy and get the mental stimulation they need to be content. They are also good candidates for agility or advanced obedience training. Though they were originally used to hunt vermin on farms, Miniature Pinschers are not suitable hunting companions. They are not known for their tendency to listen or obey unless it directly benefits them, and they are prone to wandering. They will, however, keep your yard rodent-free. What Is a Hackney Gait? Miniature Pinschers walk with a distinctive prance that is referred to as the 'hackney gait' because it resembles a Hackney horse trot. The high-stepping prance of the Miniature Pinscher is smooth and efficient—if a little silly. You will most often see this behavior when the Min Pin is showing off. Why Do Miniature Pinschers Burrow Under Blankets? Miniature Pinschers are former rat catching dogs, and they may instinctively burrow under blankets as many other ratting dogs do. They're also fond of the more comfortable things in life, so they find the most plush places to nap whenever possible. If the burrowing seems excessive, a visit to the vet may be in order to rule out anxiety concerns. Is a Min Pin a Miniature Doberman Pinscher? Miniature Pinschers are not merely a smaller version of Doberman Pinschers. This kingly toy breed was developed separately from the Doberman, from different types of dog. The Miniature Pinscher is speculated to have been developed from the Italian Greyhound and Dachshund, while the Doberman likely has Rottweiler and other large breeds in his ancestry.